Head from Santa Cruz to Santa Barbara along the Pacific Coast via historic Highway 1. The scenery is magnificent along one of the world's great wine routes. 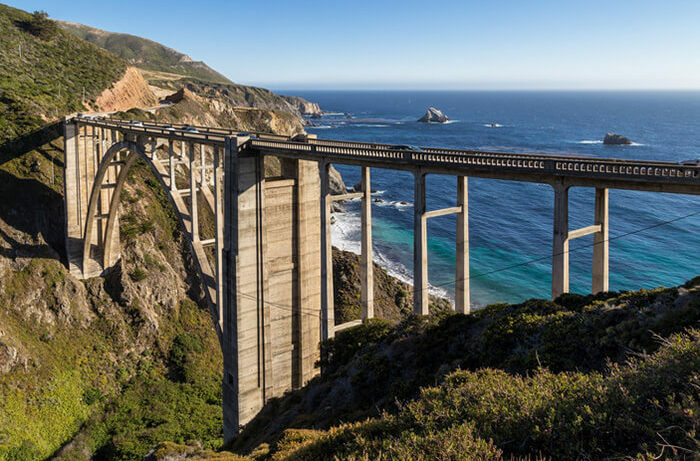 Past pounding surf, plunging cliffs and misty redwood groves, California’s Highway 1 winds along nearly 700 miles of the Pacific Coast. But grand views aside, it ranks among the world’s great wine routes, passing more than 20 of the state’s American Viticultural Areas (AVAs). This vino-centric guide to Highway 1 brings wine lovers along California’s Central Coast, journeying south from Santa Cruz to Santa Barbara. Surf City meets wine country in Santa Cruz, ­located across the mountains from Silicon Valley. A paragon of beach culture, with its boardwalk and volleyball nets, the region has also earned recognition for its boutique wineries. Approximately 1,500 acres of vineyards are planted in the Santa Cruz Mountains AVA, which was the first appellation in the country defined by a mountain range. Start off at one of the oldest continuously operating wineries in California: Testarossa, set in an 1888 stone building that once served as a Jesuit seminary. Testarossa specializes in small-lot, single-vineyard ­Pinot Noir and Chardonnay, drawing fruit from ­famous vineyards like Garys’ and Pisoni. Continue to the boutique winery collective dubbed “Surf City Vintners”, which features a dozen tasting rooms in a former warehouse space downtown. Bonny Doon Vineyard occupies a former storehouse for Brussels sprouts. Beside a tasting room, there’s also the new Le Cigare Volant restaurant, named for the winery’s signature Rhône-style red blend. Inviting diners to explore “Vins de Terroir,” the wine list sorts international wines by soil type. Notable wine shops include Vinocruz, where proprietor Steve Principe carries about 60 of Santa Cruz County’s 70-plus producers. Soif Wine Shop features a global assemblage of more than 400 global labels, including bottlings from emerging wine regions like Slovenia, Slovakia and Lebanon. Next door, Soif Restaurant serves contemporary American cuisine and will pour any bottle from the shop for just $10 more than ­retail. For tasting with ocean views, walk out on the wharf to Vino Prima Wine Bar, which specializes in boutique California wines. Top choices for overnight stays include the hilltop Chaminade Resort & Spa, which overlooks Monterey Bay. Converted from a railway station, Inn at Depot Hill offers plush rooms, with themes ranging from Japanese to California beachy-chic. From 1769–1823 in California, Franciscan friars built 21 missions and also planted the first wine grapes in the region. Characterized by two uneven towers, Carmel Mission (1771) has lovely gardens. The plaza in front of Mission San Luis Obispo de Tolosa (1772) remains a popular gathering place for town events. Graced by twin bell towers, Mission Santa Barbara (1786) overlooks the Pacific. With its copper-tiled roof and bell tower, Mission Santa Inés (1804) stands out against the half-timbered houses of Danish-accented Solvang. Alfred Hitchcock fans should detour to Mission San Juan Bautista (1797), which served as a setting for Alfred Hitchcock’s film Vertigo (1958). The Monterey Peninsula encompasses four communities: Monterey, Pebble Beach, Pacific Grove and Carmel-by-the-Sea. The famous 17-Mile Drive links them all, unfurling along rocky coves and emerald golf courses. Cool air from Monterey Bay moderates temperatures, allowing grapes to mature slowly. Long respected for Chardonnay, Monterey County now earns praise for its Pinot Noir as well. In contrast to the often foggy coast, Carmel Valley basks in sunshine. Several tasting rooms lie along or just off Carmel Valley Road, including Talbott, ­Joullian and Heller Estate. Sip, sup and stay at Bernardus Lodge, where the 57 elegant guest rooms are surrounded by lavender and vineyards. Casual yet classy, the property’s recently redesigned Marinus restaurant highlights creativity from Cal Stamenov, the resort’s chef and culinary director. His California cuisine incorporates ingredients from a six-acre organic garden plus products furnished by an inspired team of local foragers and fisherman. Not many small towns boast an ex-mayor­ named Clint Eastwood or city ordinances that outlaw displaying plastic flowers in public. That describes the eclectic personality of Carmel-by-the Sea, where city officials recently approved winery tasting rooms. Accommodations capture Carmel’s charm. With its whitewashed walls and lush gardens, Cypress Inn welcomes humans and their animal companions. “If it fits in the elevator, it can stay,” says General Manager Fiona Vanderwall, noting the guest roster has included a llama. The hotel is co-owned by noted actress and animal-rights activist Doris Day. For European-style luxury, stay at the L’Auberge Carmel with its acclaimed restaurant, Aubergine, which occupy a restored 1929 building. Founded in 1770, Monterey preserves its past with its Path of History, a self-guided walking tour of historic adobe structures. Among them is Restaurant 1833, a James Beard nominee for Best New Restaurant in 2012. There, Executive Chef Levi Mezick harmonizes sweet and spicy elements in dishes like hamachi topped with oranges and pickled jalapeños. The five-course tasting menu, at $65, is available with wine pairings for a modest surcharge (about $30). Watch over your meal: The mischievous ghost of former owner Hattie Gragg is said to pour salt into wine glasses. From the 1920s to the 40s, Monterey was the sardine-packing capital of the world, an era recalled by John Steinbeck in his novel, Cannery Row. Set on a dock by the bay, the new Schooners Coastal Kitchen & Bar at the Monterey Plaza Hotel & Spa features fresh, uncomplicated seafood as well as local wines. 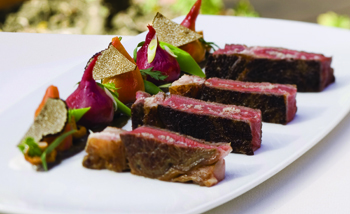 The Sardine Factory fields a 1,700-label wine list, plus sumptuous entrées like fresh abalone and rack of lamb. Mountains plunge straight into the sea in Big Sur, which encompasses 90 miles of coast from Carmel to San Simeon. Past residents have included such avant-garde writers and artists as Orson Welles, Henry Miller and Jack Kerouac. 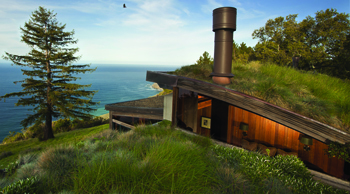 The area still thrives as an arts community, epitomized by exhibition spaces like the Hawthorne Gallery and the Coast Gallery Big Sur. Although Big Sur has no vineyards, it offers several venues for enjoying great wine. Lunch at legendary restaurant Nepenthe , a favorite of 1950s Beat writers. You’re not going for the food (predictable ­burgers and sandwiches), but for views of 40 miles of coast paired with a surprisingly good wine list. Nestled among redwoods, the Ventana Inn & Spa blends wilderness with elegance. At 1,000 feet above the Pacific, the resort’s restaurant might feature venison with spaetzle, or Hawaiian cod with corn-and-leek risotto. Deer often tiptoe atop accommodations at Post Ranch Inn, where several lodgings—built into ridgelines—have sod roofs. Floor-to-ceiling windows enhance the vistas from its Sierra Mar restaurant. Holding more than 13,000 bottles, the cellar emphasizes grand estates and esteemed small producers. Sixty miles south of Big Sur, Highway 1 levels off into undulating cow country. Nearly everything you see once belonged to newspaper magnate William Randolph Hearst. With its 165 rooms, framed by flamboyant pools and towers, Hearst Castle in San Simeon remains his most outrageous achievement. Grapes now rival Hearst Castle as the top attraction in San Luis Obispo County. From Highway 1, detour east on California Route 46 to Paso Robles. Cool oceanic air drawn through the Templeton Gap produces huge temperature swings between day and night. Rhône varieties, like Syrah, adore such contrasts, which help to keep acid levels high. Tablas Creek Vineyards is a collaboration between the Perrin family (fifth-generation owners of Château de Beaucastel in Châteauneuf-du-Pape) and American importer Robert Haas. All of their estate-grown grapes are Rhône varieties and organically farmed. JUSTIN produces Isosceles, a powerful Bordeaux-style blend. Intimate and elegant, The Restaurant at JUSTIN offers a five-course dinner ($95) showcasing local ingredients like Monterey Bay tuna and ranch-raised beef. Live the wine-country lifestyle by staying at the winery’s JUST Inn ­bed-and-breakfast, a four-room hideaway surrounded by gardens. Much of the Syrah grown in the United States descends from vines planted by Gary Eberle. His Eberle Winery ­focuses on Rhône varieties. Turley Wine Cellars sources old-vine Zinfandel from throughout California. Bypass the waiting list for Turley’s wines by buying them in person at its tasting room in Templeton. The town of San Luis Obispo combines history (it was founded by Franciscan friars in 1772) with the youthful enthusiasm of a college town (it’s home to California Polytechnic State University). Several restaurants boast shady patios along a picturesque creek, including Novo Restaurant and Lounge, which serves global cuisine. Nearby Edna Valley is known for Chardonnays lush with tropical flavors. Tolosa has a gorgeous tasting facility overlooking the fermentation room. Situated in Arroyo Grande, Laetitia Vineyard & Winery is a producer of méthode Champenoise sparkling wine, as well as Chardonnay, Pinot Noir and Pinot Blanc. Baileyana Winery produces complex wines from its Firepeak Vineyard, which abuts a chain of ancient volcano cones known as the Seven Sisters. Part of the same volcanic group, ­Morro Rock juts 578 feet above the ocean, inspiring its nickname “the Gibraltar of the Pacific.” Still a working port, the town of Morro Bay highlights fresh seafood. Those in the know head for Tognazzini’s Dockside Restaurant. The best accommodations deliver ocean views. Newly renovated, the Inn at Morro Bay is perched in Morro Bay State Park. Beachfront in Pismo Beach, Dolphin Bay Resort & Spa offers huge apartments accented by marble. Set on a promontory, Ragged Point Inn and Resort is a serene hideaway 20 miles north of Hearst Castle. Starfish and anemones lounge in tide pools at Point Lobos State Natural Reserve (just south of Carmel). In Big Sur, picnic at Pfeiffer Beach, or follow a trail through a rock tunnel to electric-blue Partington Cove—once a hideaway for bootleggers. Crowning a 360-foot-high basalt rock, Point Sur Lighthouse is the only intact 19th-century lighthouse open to the public in California. At Piedras Blancas (north of Hearst Castle), thousands of elephant seals congregate along the shore to mate and bear their pups. With tile-roofed houses and a seaside promenade lined with palm trees, Santa ­Barbara resembles a village in the south of France. Although the county’s vineyards flourish inland, several tasting rooms have sprung up in the city’s “Funk Zone,” a revived neighborhood where surfboard-shaping shacks jostle with winemaking warehouses. In 1962, Pierre Lafond opened Santa Barbara Winery, the first in the county since Prohibition. Sanguis (sanguiswine.com) merges offbeat wine names like The Ballad of John Henry and Postcard from Morocco with on-target renditions of Rhône varieties. Au Bon Climat recently opened its first tasting room in Santa Barbara. Viticultural visionary Jim Clendenen crafts highly regarded wines, including Chardonnay and Pinot Noir from the renowned Bien Nacido Vineyard. Santa Barbara restaurants spotlight local wines. Wine Cask pairs impeccable food with a romantic courtyard setting. The expansive cellar accentuates Central Coast selections. Newly opened, Cielito celebrates authentic, zesty flavors from Mexico and South America with its antojitos (Mexican street snacks). The bar offers first-rate Tequilas, plus cocktails made using house-made infusions. Opened in 1927, Four Seasons Resort The Biltmore Santa Barbara upholds its history, complete with terra-cotta floors and hand-painted tiles. Located downtown, the Canary Hotel features wine-tastings-with-a-view from its fabulous rooftop lounge. 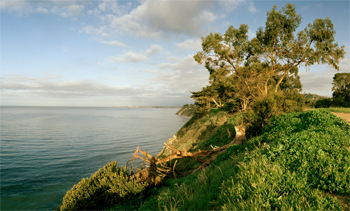 The valleys that probe inland from the Pacific are Sideways country—much of the 2004 Oscar-winning film was shot here. Santa Maria Valley opens to the ocean, creating a cool climate and long growing season. Pinot pundits similar to the film’s character Miles will enjoy Cambria Estate Winery, where visitors can often sample wines made from different clones. Hunker into Santa Maria’s famous barbecue at the Hitching Post, with locations in Casmalia and Buellton. Here, meats are grilled over red oak, and the Hitching Post wines earn high marks. A one-time stagecoach route, Foxen Canyon Road shimmies past oaks, pastureland and about 20 wineries. Here, Zaca Mesa produces Rhône-style wines, including its intense Black Bear Block Syrah. Wine country meets Wild West in Los ­Olivos, where kids can be seen riding horses past the tasting rooms that line Grand Avenue. Refugio Ranch specializes in Rhône-style blends. Fess Parker Wine Country Inn & Spa, founded by the actor who starred as Davy Crockett and Daniel Boone in 1950s and 60s TV series, is a good place to stay.